The results of European Bioplastics’ annual market data update, presented at the 11th European Bioplastics Conference in Berlin, confirm a stable growth of the global bioplastics industry. “The market is predicted to grow by 50 percent over the coming years despite the low oil price,” says François de Bie, Chairman of European Bioplastics. The global bioplastics production capacity is set to increase from around 4.2 million tonnes in 2016 to approximately 6.1 million tonnes in 2021. Packaging remains the largest fields of application for bioplastics with almost 40 percent (1.6 million tonnes) of the total bioplastics market in 2016. The data also confirms a decisive increase in the uptake of bioplastics materials in many other sectors, including consumer goods (22 percent, 0.9 million tonnes) and applications in the automotive and transport sector (14 percent, 0.6 million tonnes) and the construction and building sector (13 percent, 0.5 million tonnes), where technical performance polymers are being used. Bio-based, non-biodegradable plastics, such as polyurethanes (PUR) and drop-in solutions, such as bio-based PE and bio-based PET, are the main drivers of this growth, with PUR making up around 40 percent and PET over 20 percent of the global bioplastics production capacities. More than 75 percent of the bioplastics production capacity worldwide in 2016 was bio-based, durable plastics. This share will increase to almost 80 percent in 2021. Production capacities of biodegradable plastics, such as PLA, PHA, and starch blends, are also growing steadily from around 0.9 million tonnes in 2016 to almost 1.3 million tonnes in 2021. PHA production will almost quadruple by 2021 compared to 2016, due to a ramp-up of capacities in Asia and the USA and the start-up of the first PHA plant in Europe. With a view to regional capacity development, Asia will further expand its role as major production hub. In 2021, more than 45 percent of bioplastics will be produced in Asia. 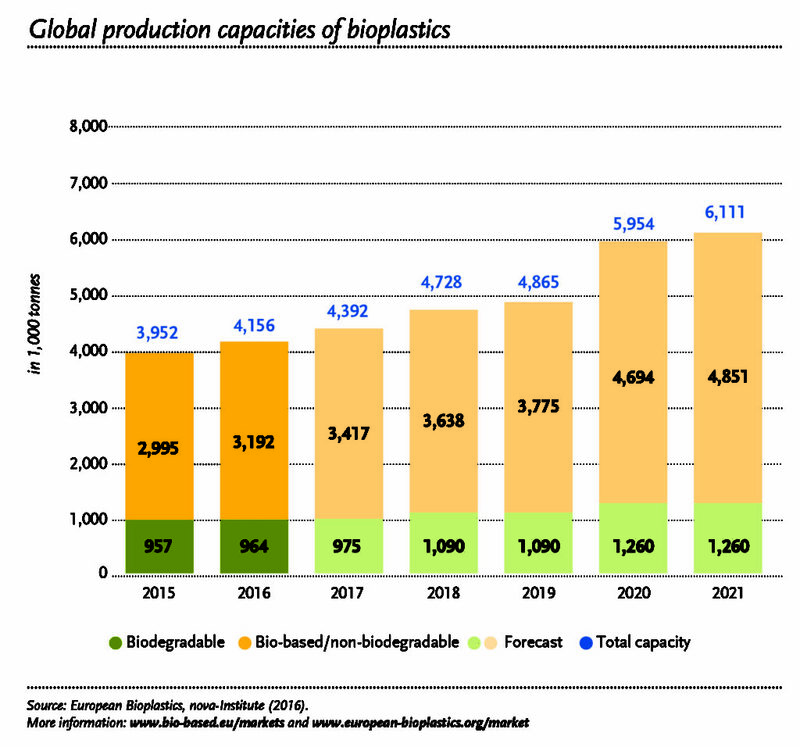 Around a quarter of the global bioplastics production capacity will be located in Europe. Bioplastics are a growing, innovative industry that offers solutions for a sustainable plastics economy and that plays a key role in the transformation to a bio-based circular economy. Yet, despite these advantages, the data shows that the overall growth of the global bioplastics industry is currently being slowed down by the low oil prices and a lack of political support for the bio-based economy.